The Radio Club de Costa Rica, IARU Member Society, hosted the 51 Convention of the Federation of Amateur Radio Club of Central America, FRACAP, from November 18 to 20 with the attendance of representatives from Guatemala, Honduras, El Salvador, Panama and Costa Rica. Different activities took place including a conference on emergency communications under the IARU (ARES) recommendation. 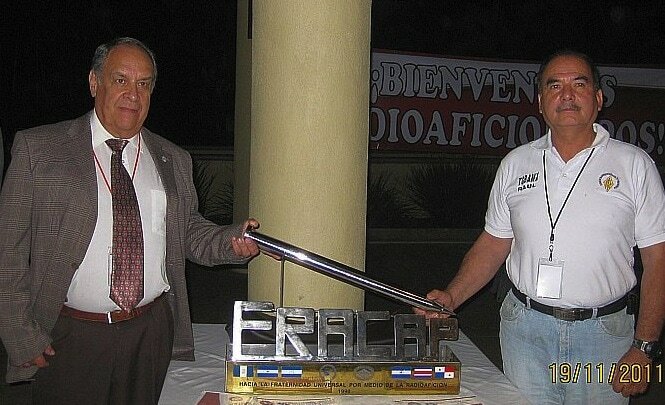 During the gala dinner Raul Muñoz TG8AMX and Eduardo Estrada TG9CL received the nail, both from Guatemala, since they will be hosting the next FRACAP 2012.